At Fleming College, we’re trying to bring Communications learning into the 21st century. That means using good research to define appropriate goals and using communication technology to help achieve those goals. Our courses focus on iterative writing, low-stakes formative writing, process and product portfolios, multi-modal textuality, authentic assessment, collaborative composition, and composition in a public space rather than a private one. It’s the last one that’s the kicker. The need is clear. Benjamin Franklin once said that all writing is public by definition, and sometimes I think we Comm teachers are still catching up to that remarkable insight. Our goal in redesigning our flagship communications courses was to build in, from the beginning, the fact of communication as a medium of public exchange (information exchange, identity exchange, influence exchange). We wanted to promote students’ existing register-shifting skills from unconscious habit to deliberate practice. It’s partly just an updated version of rhetorical lessons as old as Cicero, but it also focusses a cluster of rhetorical, compositional, interpersonal, and metacognitive skills that are quite complex in these heady times. For today’s college student, the Internet is the New York, New York of communications challenges: if you can write it there, you can write it anywhere. So, we needed a platform for public reading and writing. We eventually settled on a WordPress site for each student. WordPress is fine. It presses words handily. The problem is that grading blogs with a rubric and personalized comments, in an LMS, is a logistical nightmare. Most people use Excel to collect students’ WordPress URLs, then either use two monitors, split one monitor, or just swear constantly under their breath as they juggle a klunky LMS gradebook and a wriggling spreadsheet. Cycle through classlists of blog URLs by loading them sequentially in the default browser with a single click. Consume as little screen space as possible. Work on multiple platforms (Windows natively, Linux and Apple with the Mono Framework). Also works on Raspberry Pi, by the way. Portable and work with plain-text data files. No SQL, no weird proprietary databases etc. Must fit on a 1.44mb floppy disk. Just because. Just park the mini-bar somewhere out of the way and hit the big green button. When you finish marking a section, you will be congratulated. For Windows, just the ubiquitous .Net runtime. For Linux and Apple, you will need the (free) Mono Framework. Each URL opens in a new tab in your default browser. Tabs pile up quickly. Unfortunately, this is a browser setting that I can’t change. You can change your own browser settings, though, if it really bugs you and you are so inclined. Also, this is beta software, whittled on my porch! Bugs may pop up. Let me know if you find any. Also, let me know if you would like any changes or improvements. BlogTron.zip. Just unzip and click. BlogTron will look in its home directory for its data files, by the way, so you can run as many copies as you want in independent directories. Don’t get confused and accidentally overwrite your data files. September 25, 2018: Added setting to autosave all changes (available under “Options” menu”). Also added backup creation. 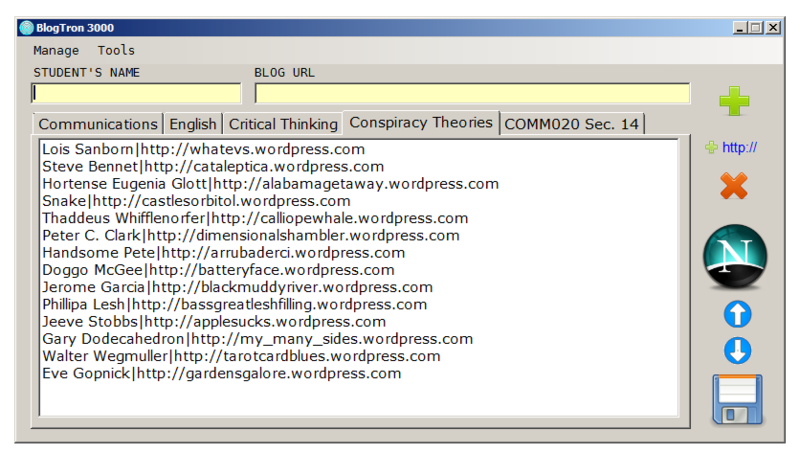 Note, however, that the backup file “BLOGTRON.INI.BAK” is created only when you manually click “Save.” This is to present a situation where someone autosaves a mistake, then automatically overwrites the working dataset with the unwanted version. June 10, 2018: Updated URL auto-format function to allow customized base blog URLS (not just the Fleming College WordPress URL). So, if your students use “http://www.wordpress.com/UNIQUE_PART” or “http://UNIQUE_PART.wordpress.com”, or really any other format (and not only WordPress), just replace the unique part of the URL with an asterisk and let BlogTron do the rest. The base URL can be accessed from the “Manage” menu. Fleming users will not notice a difference (i.e. the default base URL is still “https://wpflemingcollege.com/*”. June 7, 2018: frequently used comments are now stored in both a continuous roll and a handier pick list. Comments are automatically copied to the clipboard upon double-clicking. May 17, 2018: updated URL auto-format function to reflect Fleming’s internal WordPress site. Now, you just need to enter the unique part of a blog URL and BlogTron will do the rest.